After communications with the two national newspapers which exposed the participation of China’s Ministry of Public Security at a Seminar next month, reported to be held at Trinity Hall University Of Cambridge it now appears certain that the event has been arranged by the Centre for Business and Public Sector Ethics (CBPSE) Moreover we have been provided with a third source, one that corroborates those details and reports that academics who are planning to take part are being gagged on the issue of human rights. According to the Cambridge Student Online, a leading academic has refused to take part as a consequence of such restrictions, Professor Anthony Glees, Director of the Centre for Security and Intelligence Studies at the University of Buckingham, withdrew his planned involvement after being informed human rights abuses or cyber-espionage could not be mentioned at the Seminar. Total respect to Professor Glees for acting with such integrity, let us hope that other academics involved with this event share the same moral backbone and withdraw their participation or have the fortitude and decency to raise human rights and issues of censorship with the delegation from China’s Ministry of Public Security. The atmosphere of control and heightened sensitivity surrounding this conference has all the fingerprints of the British Foreign Office (UK equivalent of the State Department) which no doubt has made it known privately that topics sensitive to China’s regime should be kept off the agenda. 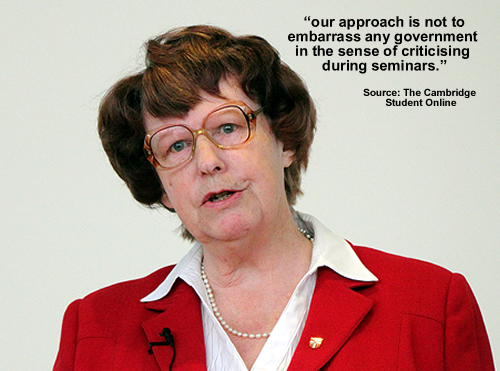 Unless of course such crass censorship is solely the demands of Doctor Thomas and her colleagues at the Centre for Business and Public Sector Ethics? Whatever the case this event is a breathtaking appeasement of China’s blood-soaked security enforcers and a shameful censorship of freedom of speech that betrays human rights in order to placate those who specialize in torture , oppression and the violent denial of basic human freedoms. Meanwhile it is being arranged and hosted by an organization dedicated to ethics, at a University venue which from now lacks any moral authority on issues of human rights, democratic freedoms and free speech! It is obvious from the (CBPSE) web site that they have long established academic and financial partnerships with China. 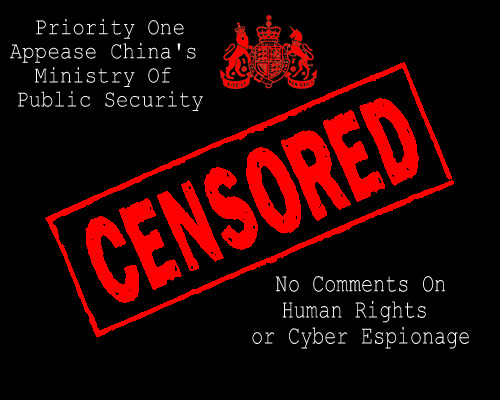 CBPSE surely respects the value of human rights, freedom of speech and equality, yet in light of it’s continuing collaboration with China’s Ministry Of Security, it must be difficult for some not to conclude that it is publicly endorsing the systematic genocide that has occurred in Tibet over the past 53 years. 1 China’s Ministry of Security invade every aspect of life. Their methodology of abuse and torture are well documented and have been reported by Amnesty International and the International Society of Human Rights, who produced a chilling report on the various techniques of torture employed by China’s security forces. Why are these method still being used on a daily basis against peaceful Tibetans. 4 Will questions on human rights be allowed during the event and participants and guests able to question the aforementioned Chinese delegation on the issue of human rights? Human rights violation in Tibet is all pervasive. Available evidences suggest that China violates with impunity every norm of civilized conduct as laid down in international law books, many of which it has undertaken to observe by affirmative acts of ratification, such as the UN Convention Against Torture and Other Cruel, Inhuman or Degrading Treatment or Punishment (Convention Against Torture), and customary laws of nations such as the UN Universal Declaration of Human Rights (UDHR). This is a free debate so why is it acceptable for China has openly criticized the UK government in speaking to the Dalai Lama on peaceful issues? 5 What level of funding etc have the CBPSE received from China over the past 17 years ? 6 I would ask you to comment on this link http://www.friendsoftibet.org/databank/tibethistory/tibeth2.html written in June 1997 it lists how 1,207,387 Tibetans have been murdered by China. It is a damming article …..so your views would be appreciated as this is still continuing today. If I receive no reply it will confirm ……..well I will leave that in your hands/pen. 7 Why is the Dali Lama demonized by China and commercial / financial pressure placed on UK Councils and the UK Government not to speak of Tibet. 8 And finally will peaceful demonstrations be allowed.